Sunnyview patient Kim Zilm makes strides using the EKSO with therapist Kathryn Greene, DPT. Sunnyview is proud to have been named a Center of Robotic Excellence by Ekso Bionics. In February, Sunnyview Rehabilitation Hospital was recognized as a Center of Robotic Excellence (CORE) by Ekso Bionics (EKSO), the developer of a state-of-the-art, wearable robotic “gait trainer” exoskeleton. CORE designation recognizes rehabilitation centers that provide high quality, coordinated health care using state-of-the-art technology and innovation, said Patricia Valenza, DPT, ATP, assistant director of Sunnyview’s Neuro-Rehab Institute. “CORE programs are committed to providing education to physicians and other health professionals, and are chosen for their commitment to measurable results in rehabilitation,” she said. Sunnyview is the fourth rehabilitation center in the United States to receive CORE designation, and the fifth worldwide. Sunnyview first introduced advanced robotic exoskeleton technology in May 2016 when it acquired the Ekso GT, the first robotic exoskeleton for use in the treatment of individuals with paralysis of one side of the body due to stroke, as well as those with spinal cord injury levels to the C7 vertebrae. Originally developed for use in military and industrial settings, robotic exoskeletons have proven to be increasingly useful in the field of rehabilitation. The Ekso GT helps patients walk by retraining their brains, and at the same time, supporting correct posture and balance. 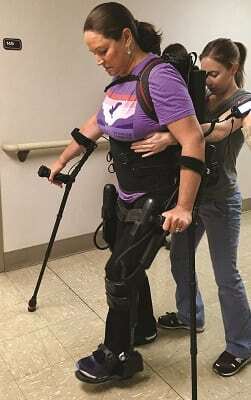 The exoskeleton provides adjustable amounts of power to either side of the body, assuring that patients are equal on both sides. As a result, patients can take more quality steps with less energy and get in more walking time during therapy sessions. As a CORE program, Sunnyview can participate in EKSO robotic technology development, as well as multi-center research opportunities. In addition, Sunnyview has access to other CORE centers to develop and share protocols to improve patient mobility through use of exoskeleton technology. Sunnyview has served as a leader in regional professional education on robotic technology. Recently, Erica Gauthier, BS, DPT, NCS, presented on robotic assisted technology at a conference in Pittsburgh, Pennsylvania, which included a live demonstration of the Ekso GT. Other CORE centers in the United States are: Marionjoy Rehabilitation Hospital in Wheaton, Illinois; Barrow Neurological Institute in Phoenix, Arizona; and Good Shepherd Rehabilitation Hospital, Allentown, Pennsylvania. Villa Beretta Centro di Riabilitazione in Costa Masnaga, Italy, is also a CORE program.